A key figurehead of the New Orleans 'revival' of the 1940s, Ory made his reputation in that city between 1912 and 1919, when he led one of its best-known jazz groups. He is reputed to have adopted most of the technical tricks developed by other pioneer jazz trombonists and absorbed them into his own playing. Certainly, he became famous in California after travelling there in 1919, and he made the first ever discs by an African-American jazz band in Los Angeles in 1921. Returning to Chicago, he not only played and recorded with King Oliver and Jelly Roll Morton, but became a member of Louis Armstrong's Hot Five, thereby appearing on some of the most influential jazz discs of all time. His energetic 'tailgate' trombone was also a key feature of several other recording groups, including the New Orleans Wanderers and Bootblacks, and his featured solos, such as Muskrat Ramble, incorporated some of the tricks he had mastered in his youth. He moved back to the West in 1930, which remained his base until his retirement to Hawaii in 1966. 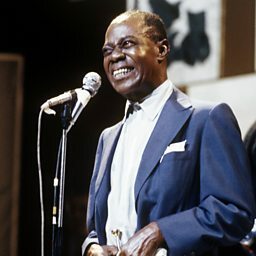 He gigged round Los Angeles in the 1930s, but after playing on television and discs in 1944, his band became the centre of the West Coast 'revival' and he was celebrated as a founding father of jazz. His own playing became more minimal with age, although he sang characteristic vocals in Creole French, but his band had a robust ensemble style with numerous subtle arrangers' touches that immediately marked it out as his, despite frequent changes in personnel. He recorded regularly and prolifically from the mid-1940s until the early 1960s, and some of his finest latterday recordings are the live and studio sessions he made with New Orleans trumpeter Henry 'Red' Allen. Edward "Kid" Ory (December 25, 1886 – January 23, 1973) was a Louisiana French-speaking jazz trombonist and bandleader. He was born in Woodland Plantation, near LaPlace, Louisiana.